WCF Data Service item template for Visual Studio 2017 and 2019. 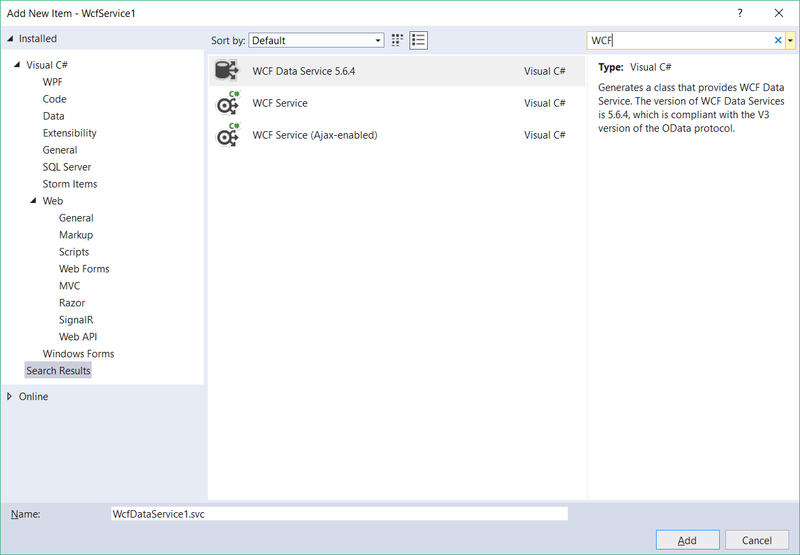 With Visual Studio 2015, you could create something called a WCF Data Service. This is basically an OData capable endpoint that is wrapped around and Entity Framework context and you can use the OData endpoint to access the context, which in turn accesses the database. Unfortunately, from VS 2017 the IDE does not support creating WCF Data Services from a template. Even if it did, the old template from VS2015 scaffolds code that is not compatible with the new Entity Framework versions. The code itself is pretty similar, but you have to use a different base class from a different Nuget package. This extension is here to help you if you want to create a WCF Data Services using VS2017 and above. The item template is available for both web app and web site based templates, both for C# and VB.NET. The template itself is pretty self-explanatory: just follow the comments and substitute the right classnames. All the Nuget packages are embedded in the VSIX itself (the original template specified a registry key, which specified a folder on your hard drive that contained the packages). Changed the base class that the context is derived from; this was necessary to make it work with EF 6 and above. Check out the license notes here or in the Github repository of the project. Use it at your own risk :) Also note that most of the heavy lifting was actually done by MS with the VS2015 version, all credits and the respective rights belong to them. Don't forget to check out my blog post on the making of the template!